Ball sports and games have greatly attracted many people of all ages around the world. People love ball sports because they can gather friends and family members to play and have fun together, which meanwhile strengthen their bonding. The quality ball sports equipment and gear that BestDeals stocks are suitable for every sport, level and budget. Check out our ball games gear of your favourite sport, from badminton, soccer, table tennis, to basketball, volleyball, and more. 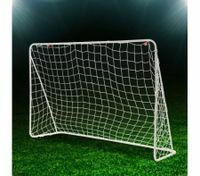 If you have an active kid who enjoy outdoor sports, or if you like getting together for a ball game with friends, a soccer goal can bring you great fun more than you’ve ever imagined. With a strong steel frame, outstanding white colour, and modern lightweight construction, this goal will serve you and your aspiring soccer fanatics for a very long time to come, and for great portability to be taken anywhere along with you as well. Besides, our badminton shuttlecocks made of good quality white goose feathers are durable enough for practice, training or casual playing. If you are table tennis aficionado, to help improve your playing skills, look no further than our best table tennis training ping pong balls, white or yellow. Overbudget purchase will not be your concern since the greatest discounts are offered for our popular ball sports gear right now. Grab everything you need at BestDeals, then invite your old friends to enjoy your favourite ball games together.